The story I’m going to tell you about an always under appreciated promotional product is true. The names and locations have been changed to protect a consumer from drowning in unwanted but insistent marketing efforts. My Dad is 81 years old, oxygen dependent, but still (by far) the smartest guy in the room. He lives alone, and has since my Mom passed last year. While he has every service (cleaning lady, cook, gardener, plow guy) imaginable at home, the house, without my mother, is too big. Too lonely for him. He’s warming to the idea of an assisted living community. Now you see the need for secrecy. If his name and intention were made public the poor soul would be swamped under a deluge of glossy, multi page brochures. He’d be turning down event invitations left and right, and his phone would be ringing off the hook with cheery “check in” calls. I last researched assisted living for him about a year ago, protecting him from the marketing efforts if you will. I visited several local, well-regarded places and only one facility made the cut. The apartments were perfect, the location was close to doctors and favorite haunts, there was freedom with help if needed, there were people, regular trips to lunch or the movies. At the end of our tour, the guide gave us a mug (imprinted) filled with treats along with a brochure. She urged us to give this to my Dad with their good wishes. We lost (or filed) the brochure. I ignore the calls I still get. But we hung onto that mug. It was the mug, a simple white mug with bold, colorful lettering, that supplied to us, a year later, the name of the facility we liked best. The name was right there, still big, bold and readable, when we needed it. That’s how mugs (and other promotional products) work. they put your name and contact details right at hand. Today and a year later. Mugs offer lots of choices in terms of colors and styles — plenty of room to display your company logo, name or other details. We know from research (AND experience!) 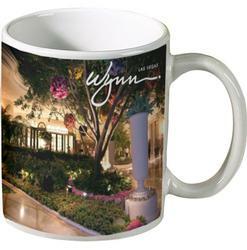 that promotional products (like mugs) with a business name are everyday practical and get your business noticed. They don’t get missed. They aren’t ignored. They don’t fade away. They work for your business.